Charleston is rated the fifth most popular vacation destination in the United States, and it surely must rank in the top five among places to spend the rest of your life. If it doesn`t yet, it eventually will. Visit the city once and you`ll discover that it pulls at your heartstrings like no other place in the country. Is it the delightful year-round climate? The almost-European feel of its downtown city streets? The overwhelming amount of history lurking behind every corner and down every alley? Charleston is truly one of the most cosmopolitan places around, offering sophisticated dining rivaling that of much larger cities and shopping experiences for even the most jaded consumers. To say that Charleston is steeped in history is much like saying the sun is yellow. Other places have long histories as well, but none is a living museum that grows and changes with the times. 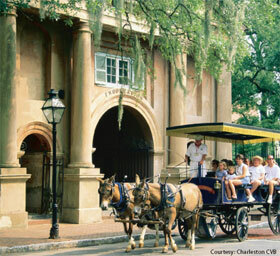 Suffice it to say, if you`re a history buff, you will never grow tired of Charleston and the surrounding countryside. "Visit the city once and you'll discover that it pulls at your heartstrings like no other place in the country." While the city itself has no beaches, it is surrounded by water on three sides. If you`re lost, just continue on and you`ll surely run into a familiar river and get your bearings. The most picturesque spot in Charleston might be The Battery, with its panoramic views of the Ashley and the Cooper, the two rivers that form the peninsula, and the Atlantic Ocean. If you love the sights and sounds of gentle waves lapping against the shore, you can reach some of the best beaches along the Atlantic coast in a matter of minutes. If you revere golf, there is no shortage of challenging courses to conquer. If you enjoy walking, Charleston is full of interesting little parks and side streets filled with art galleries and boutiques. In spite of all that Charleston offers, it maintains a small-town charm you`ll cherish for years to come. If you are looking for restaurants, cruises or vacation packages, look no farther! You`ll love morning strolls around Colonial Lake and sunset cocktails at restaurants overlooking the water. You`ll come to appreciate the intricate artwork in the wrought-iron gates and the lovely Charleston single style of architecture, designed to catch the breeze on sultry afternoons. Most of all, you`ll cherish the many new friends and acquaintances you`ll make when you choose Charleston.